Dragons is a full traditional Tang Soo Do program with an age appropriate reduction in the demonstration of curriculum required for rank assessment. At Saenghwal Hohup Kwan Tang Soo Do Federation family classes Members are welcomed, respected and encouraged to make progress at their own pace. The primary purpose of the Saenghwal Hohup Kwan Tang Soo Do Federation is to deliver the benefits of a healthy lifestyle supported by both internal (benefiting organic health) and external (benefiting muscular and skeletal health) combat orientated exercises and Martial ethics to all of its Members. Martial ethics aid character development and focus on good citizenship. We do all of this in an environment where Members free from physical harm and emotional intimidation. 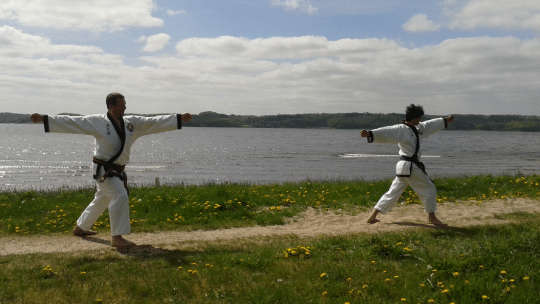 Family Martial Arts Classes in Rugby, Kenilworth, Warwick and Leamington Spa.